The Cobblers have bagged themselves more than just a winger in new signing Kenji Gorre, according to boss Rob Page. 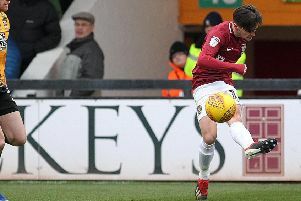 Gorre is a player that Page has been tracking for more than two years, and although he is classed as a winger the Cobblers boss believes the Dutchman will be able to play in a variety of attacking positions. “Kenji plays predominantly wide left, but he can play as a number 10,” said Page. “He played for Swansea’s first team as a number 10 the other night against Swindon, so he can play on the right, on the left, as a 10, and he is a gifted footballer. “He will find a cross, he will get balls in the box. That is one thing we want this season and he will certainly deliver that. Gorre becomes Page’s eighth signing of the summer, and is the second attack-minded player to be recruited in the space of a week following on from the addition of Harry Beautyman from Peterborough United. And the Cobblers boss believes the pair will be a real handful for Sky Bet League One defences in the forthcoming season. “You look at Harry Beautyman the other night, I was pleased with his enthusiasm and his work-rate,” said Page. It has taken a while, but Town now seem to have replaced two of last season’s key men in Ricky Holmes and Nicky Adams, who departed for Charlton and Carlisle respectively earlier in the summer. But even thouigh Page believes Gorre will be a hit with the Cobblers fans, he has also warned not to expect too much too soon from the 21-year-old, who has only made one senior appearance in English football. “Kenji is a young one and we have to manage it,” said Page. “He is not the finished article by any means, because if he was then Swansea wouldn’t let him out.